"Trading Urban Stories" included a "Networked Storytelling Space", a 12-hour Radio Happening and a sound installation for headphones. 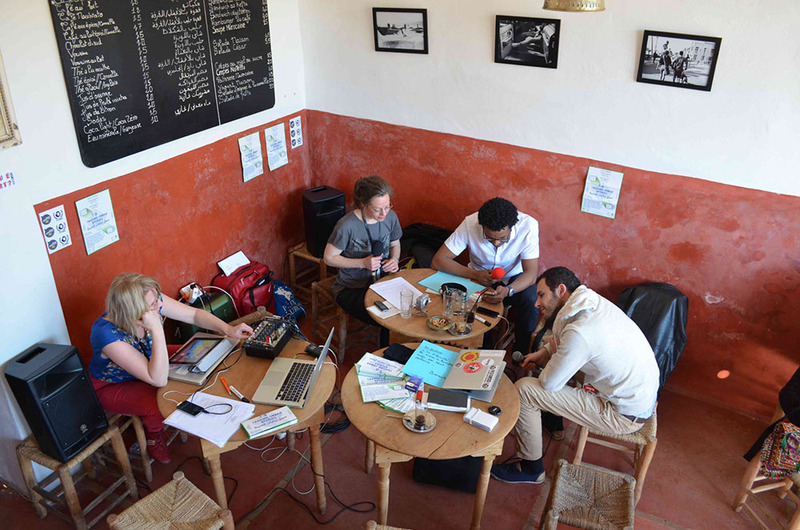 Designed as a central part of the project the Radio Happening was an attempt to initiate discussions between the inhabitants of Marrakech, international artists and students. It combined conversations and concert performances from a studio in a café in the Medina by short-cuts with shots of the alleys and in the Riads of old town. The sound installation was an opportunity to listen to two of C-Drík and Abdallah M. Hassak aka Dubosium composed for the Radio Happening pieces, surrounded by soundscapes from Alexandria and Marrakech by Julia Tieke and Berit Schuck. "Trading Urban Stories" was created as an official contribution to the "Parallel Projects Program" of the "Marrakech Biennial 5" in February 2014 in collaboration with Udo Noll (radio aporee) and Anna Raimondo (Radio Saout), Bura Arikan, Greta and Lisa Tiedje , Jallal El Allouli, Jean Feline (Riyadh Biba), Kamal Laftimi (Café des épices), Ilaria Gadenz and Carola Haupt (Radio Papesse), Yassin Adnan etc.